With a beauty reminiscent of the south of France, this proud and impressive arrangement holds nothing back. 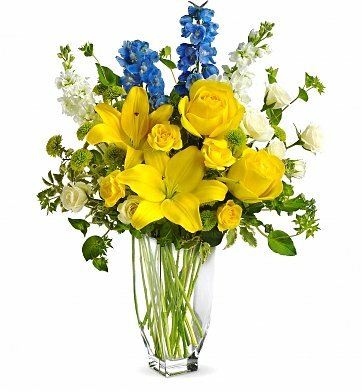 A tall glass vase is filled with freshly cut flowers such as yellow roses, spray roses, and asiatic lilies, contrasted with striking shoots of blue delphinium. The bouquet's uplifting colors and sweet fragrance are simply magnifique! French Gardens Bouquet is a hand delivered gift. These gifts are delivered by one of our local design centers located throughout the United States and Canada. Same day delivery is available for most gifts when ordered before the cutoff time. The cutoff time for French Gardens Bouquet is 12 PM in the recipient's time zone. Your flowers were exactly as shown in your picture online. They were fresh and very colorful. I will definitely order from you for my future orders! Thank you! Very lush and full, not to mention, beautiful!